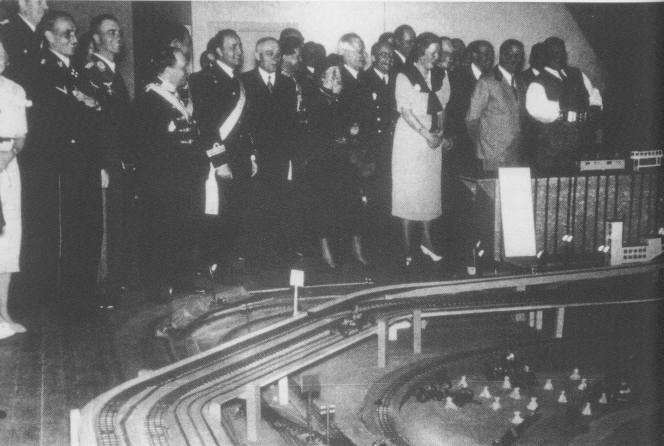 Much has been discussed about Hermann Goring’s miniature trains: how did he get them? how many trains did he have? where have the trains gone? In this article all of these questions will be discussed even though many of the questions will remain unanswered. Thanks to many months of research, incredible photos and documents were discovered relating to Hermann Goring’s railways and his house at Carinhall where they were contained. Research proved that many individual sources (books, magazine articles, etc.) were not all 100% accurate but that the information would only make sense when all of these smaller sources were put together and analyzed as a whole. It is my hope that this article will become the basis for further research to be done on this topic. It is first important to understand that Hermann Goring, the commander of the Luftwaffe (German air force during WWII) and Reichsmarschall of the German forces, was a rather corpulent and certainly gregarious man. He made every effort to dramatize a situation and blur the details in order to make himself look all the better in the eyes of his admirers. 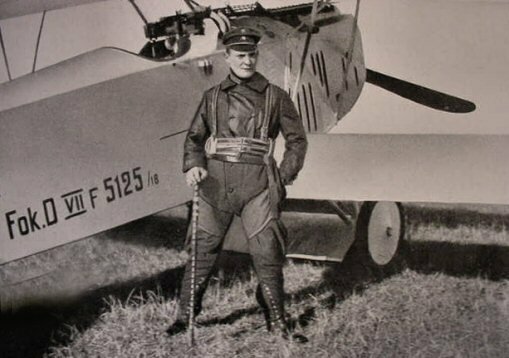 As a self proclaimed top ace in WWI, Hermann Goring won countless medals for downing an incredible amount of enemy planes and in some stories, Goring supposedly was able to take on a French bomber all on his own. It was later found in his personal diaries that many of these accounts of incredible heroism and courage were ill-founded and in many cases entirely untrue and fraught with embellishments. This characteristic of Goring is very important to take into account when analyzing documents and other pieces of information which come from him alone and are not corroborated by other sources. 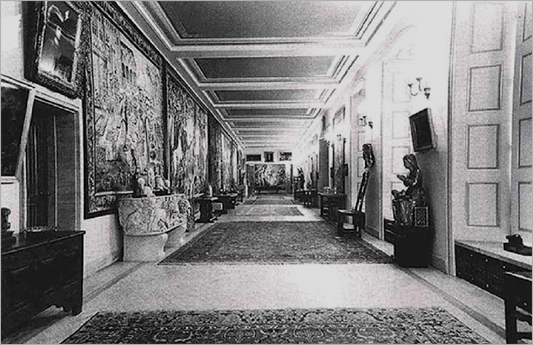 Goring also had a special liking for antiques and other priceless historical artifacts including Greek statues, Rembrandt paintings, art sculptures, and more. Most of these pieces were acquired (stolen) when German forces attacked a city. Special teams would be in charge of looting museums, libraries, and private collections and then taking an inventory of all the items to be dispersed across the Nazi chain of command. Many of these items ended up in Goring’s Carinhall, his summer hunting retreat located just northeast of Berlin. The cabin, modeled after a Swiss hunting lodge, underwent many renovations and expansions during its existance from roughly 1933 – 1945. 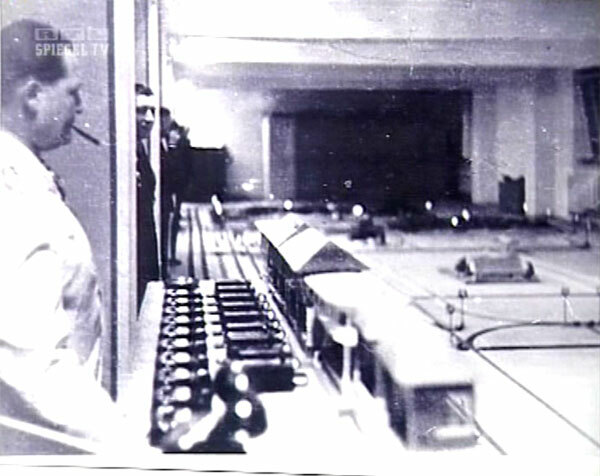 As it so happens, Carinhall also housed Goring’s extensive model railway…model railways, that is. 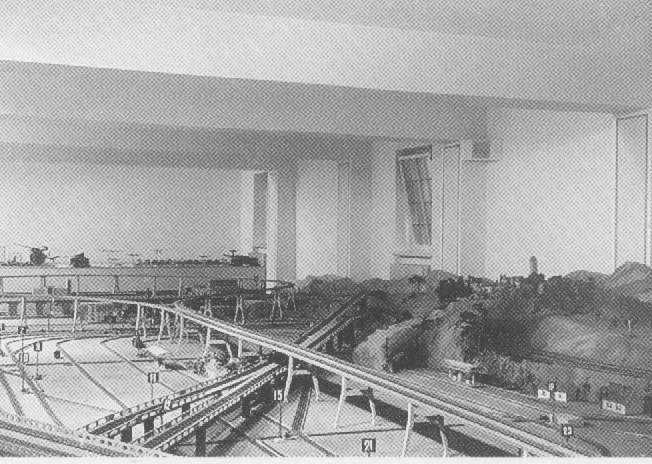 Yes, it is widely known that Goring had both Trix and Marklin railways, but many publications neglect to observe that Goring had two Marklin railways; one in his basement and one in his attic. One such book even shows a picture of Goring operating his Marklin O and I Gauge railway and the caption in the book states that this railway was in his attic. However, the differences between the attic railway and the basement layout can clearly be seen (not to mention the structure of the basement / attic — the basement has flat ceilings whereas the attic has sloped ceilings exactly as Carinhall had slanted roofs). The attic layout, which I believe was built first and then expanded into a basement layout, was probably put in place somewhere between 1933 (Carinhall’s initial building date) and 1938 (when this photo was taken). Figure 3 Goring operating attic layout for house guests including Admiral von Horthy. The above photo might also be proof to the rumor that Goring had an overhead airplane system which could “bomb” trains below by dropping little wooden bombs at the push of a button. Supposedly he would put on a show for his guests by timing the track below and the plane above such that the little wooden bomb would land on the train. The left side of the photo above shows two wires which run the length of the room above and parallel to the tracks. This wiring would be perfect to string a plane to for a bombing run on the train below. A suitable mechanism for dropping wooden bombs would be an electromagnet on the bomb bay of the airplane which releases the bomb when the current is cut off (by way of a switch on the control panel). This might explain why there are two wires: one to hold the plane and the other to hold the wires which power the electromagnet. 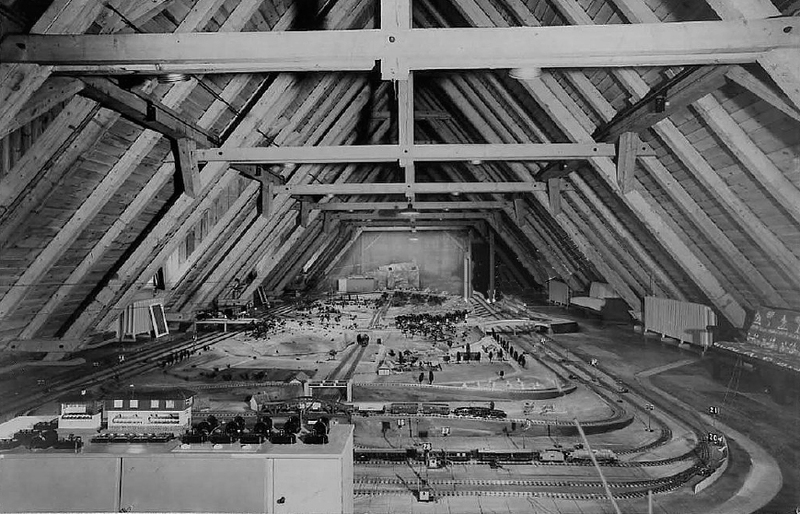 The basement layout which I believe was created after the attic miniature railway was probably slightly larger than the attic layout and certainly became much more developed with elevated rails and a car racing system which was most likely borrowed from the attic layout. 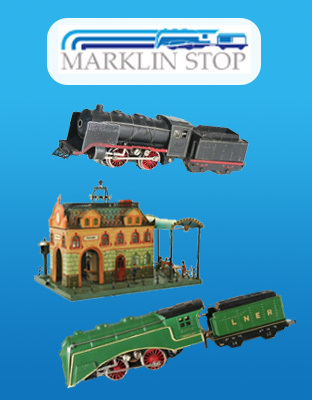 Rumor has it that as many as two Marklin employees also worked for an unknown period of time on Goring’s layout. Another first hand account states that the layout was built by Siemens & Halske, an electrical engineering company during that time. The play cellar which house the attic railway was approximately 240 square meters. Because no overall photos of the basement layout exist (as far as I know), I used 3D modeling and animation software to create a reconstruction of Goring’s basement layout. Using Goring’s approximate height (5 ft. 10 in.) and the known square-footage of the basement, the dimensions (Length X Width X Height) of the basement were calculated. Other features of the basement not seen in the historical photos are pure speculation. Whether he had expensive pieces of art or furniture in his basement is not known to me, but it certainly would fit with how the rest of Carinhall was decorated. Figure 6 If the Carinhall basement were in fact rectangular, it would have been quite long! Figure 10 Basement layout — possibly later than previous photos as the layout is more developed with elevated tracks and racing system. In the background several models can be seen set up on the tabletop. The two on the left side look like artillery / mortar pieces while the on on the right is perhaps a tank or train-mountain gun piece. What still remains unclear is where this train system and its pieces ended up after Carinhall was abandoned and destroyed in 1945. This is where much of the research turned up blank results: the itemized list of articles removed from Carinhall from workers could not be found, documents detailing the contents of Goring’s private train which was hidden in a tunnel for safety could also not be found, and the present-day grounds of Carinhall are supposedly protected which would circumvent any location research. Museums around the area do have Carinhall exhibits which contain old rusty trains which are literally torn to pieces and said to have been found at the site of the destroyed Carinhall. Others who have visited the site of Carinhall in present day also attest to the fact that train parts lay scattered in the dirt around the area. This does not, however, preclude the possibility of some of the more valuable trains being saved. An equal amount of stories exist which support the survival of some if not all of the train materials from Goring’s collection. The idea that Goring had special production Marklin trains (e.g. Rheingold livery 40CM cars, 1930s Super-Modelle locomotives specially produced in I Gauge, etc.) still remains in question. It seems that these special order trains would have shown up in the pictures discovered in this article however none of them do. All of the trains pictured in this article are from normal production and typical of the time period in which the photos were taken. 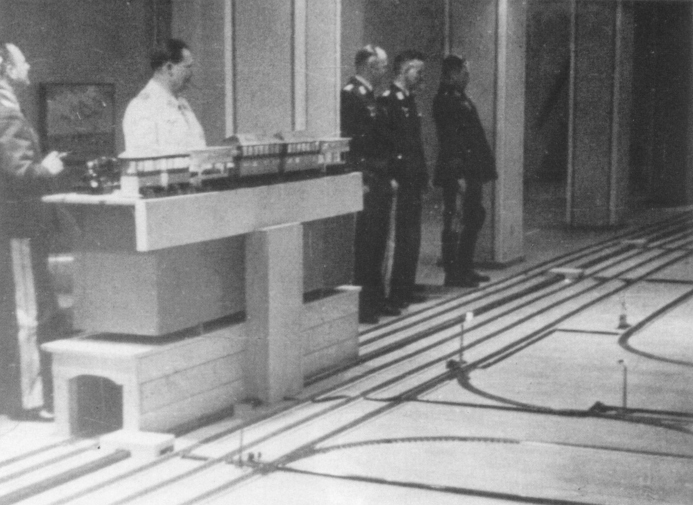 Although this article hopefully presents a clear picture of Hermann Goring’s Marklin miniature railway, many questions still remain unanswered and particularly the most important question still has an unclear answer: where did all the trains end up? Figure 3: Hermann Göring Collection (Library of Congress); Hermann Göring’s activities, May-August, 1938, Photoarchiv Generalfeldmarschall Hermann Göring, v. 27, p. 206, no. 6. Figure 7: Private photo collection, photographer probably Walter Frentz who was one of the few photographers to take photos in color of the Nazi high command (he was frequently Hitler’s photographer and cameraman). This photo was also taken by Walter Frentz supposedly in 1945. The same locomotive is featured in that photo. Figure 8: RSL, Spiegel TV. exact source unknown. Another reference can be found here. Great research, Paul! An intriguing story especially in view of the questions left unanswered. Do the Marklin or Trix archives contain records of work done for Goering or any special production or purchase of standard items? Probably not a welcome topic for them. I’m glad to hear you enjoyed reading the article. I haven’t put much effort into contacting either Trix or Marklin for the reason that you have stated, but I suppose it is worth a try. 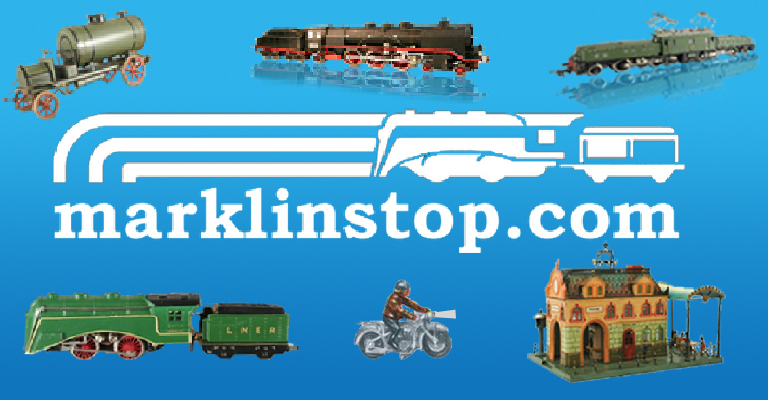 I am trying to get my hands on a Marklin magazine issue which supposedly shows a photo of Goring’s special train in Gauge 1 but other than that I don’t have any other information. I’ll definitely keep the article updated with whatever I find. Good story! I don’t know if the picture on the Forum was an O gauge or a No 1 gauge or even any connection to my train set. My father was stationed in Frankfort AM after the war and was commander of the labor supervision corp (Over thousands of displaced Pols,and people from eastern Europe!) as such, he was given many gifts and tokens of thanks for his work to keeping these people alive and employed ( Loading and unloading planes during the Berlin Airlift, etc) Somewhere along the line he came upon the CER13021 that I have pictured on my website and have had all these many years. If you would like, I could send you some moer pictures and do a little more research. Good to hear from you and glad you enjoyed the article. The train pictured on the forum is Gauge 1 just like yours (I saw the photos on your website)…seems to be a very similar model if not the same one. Still looking for some more Gauge 1 track but that stuff is hard to find in the US! Are you shure it was a Märklin layout? I have heard long ago he had Trix? Or he was mixing from Märklin, Trix and Bing? Most Modelrailroaders of today have a mixed fleet on their layout. Thank you for your comment. The two layouts pictured in the attic and basement are indeed Marklin layouts. 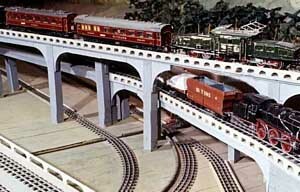 I do have a few photos of Goring standing at a much smaller Trix layout too but have no record of Bing. Besides the attic and basement layouts we know Goring owned a lot of Trix trains and furthermore he is said to have owned also some Marklin gauge 00 stock. In some discussions I saw the speculation whether Goring had some Bing trains too. After dealing with that question I consider it to be impossible on a grand scale. The Bing company got in big troubles after the Black Friday 1929. They had financial embarrassments, then finally felt into insolvency in 1932 and could not continue with their production of toy trains. All this took place before the enlargements at Carinhall took place. At the time when attic and basement layouts were ready we have to assume, that nearly no new Bing toys were still in the market. Therefore we can exclude the possibility that Goring in accordance with his own understanding of its position as “Reichsmarschall” dealt with used toys while he was overwhelmed with Marklin’s and Trix’s innovatons and new toy articles. I enjoyed the article and photographs, Paul. Congratulations on the excellent research effort. Wow, Paul, this is a really great article. I was cheered when I read that it’s been disproved that Goring showed courage in WWI, which I was surprised to read until I read your piece further, because he was such a coward and so nasty in WWII, obviously. Just the idea that he’d have little wooden bombs falling to show destruction to his guests who came to watch tells a lot about him, doesn’t it. The sofa to the right in the Attic photo really helped me get an idea of size, perspective, etc. SOme day, I’ll tell you a funny story about an acquaintance of Uncle W’s and mine who had Albert Speer for dinner. Seriously! Goring was the worst of the worst…….I’m hoping he didn’t have special trains because he doesn’t even deserve the normal ones he did have! I would not be surprised if there was a lot of Bing equipment in Goerings stuff. Bing was owned by a Jewish family and thus most likely plundered. In May 1940 I was standing on the open door front balcony of an Amsterdam streetcar when German soldiers stopped the tram and on the right side of the tram (my side) Goering appeared in an open car. His convoy made a U turn in front of the tram to go to a famous Dutch cigar store. I could have dropped a hand granade without much trouble right in bastards’ lap. I did not have a granade, just as well, they would have murdered thousands in the city. Göring is one of the greates pigs in history. His name should better be forgotten forever. I agree with you Goring was a pig. That is why the bulk of the article is about the trains and not Goring. I talked about Goring in the beginning because there are people out there who have never heard of him or know what he did. Should we forget how he has impacted society? Should we forget the countless pieces of priceless art which he stole during his reign in Europe? I am okay to disagree about whether or not we should forget Goring as a person but what about all of the history and all of the art which is crucial to culture. It would be very romantic indeed if one day a secret stash of all the trains could be found, but isn’t it more likely that the whole layout was simply blasted to bits with the rest of the building? Danke für die Fotos + Infos über Görings Eisenbahn.-Viele Fotos / Filme über Carinhall in der Schorfheide können Sie auf you tube sehen. Articolo davvero interessante. Non conoscevo Goering sotto questo aspetto, certo resta la pessima persona che è stata e non bisogna dimenticarlo. Si sa qualcosa circa la Trics divenuta Trix? Wir wissen etwas über die Trics geworden Trix? Does anyone know anything about the Trics become Trix? I’m sorry for the delay in answering but I only found this site today. I understand that the name Trix came from Tri-X, describing the arrangement of the holes in their constructional system (similar to Meccano), which are in three rows staggered in X formation. As one who has had distant relatives murdered by Goring, it is difficult to separate the Monster from the hobby. Never the less, history should be reported as it was and it is a reminder that Monsters throughout history have many normal traits and hobbies and actions. That makes them appear normal and makes them dangerous. While I would have preferred an Article on Frank Sinatra’s or Buster Keaton’s trains, this does provide a reminder or in some cases an education on one of the most horrible periods in history. Looted or wilfully destroyed by allied soldiers. As an owner of a Marklin set purchased by my Dad in Wiesbaden’s largest Spielwaren shop (which then had the famous glass enormous cuckoo clock built into its exterior (back in December 1962) I’ve always enjoyed playing with and (as education bureaucrats and profs would be wont to say, “exploring my growing tactile senses and coordination skills” as I’d plan one layout after another. We’d just set up “home” in the top floor of a just built apartment building that was considered “on the economy housing.” Talk about tight living conditions, especially since the roof was slanted. But I managed to have a spot set aside for setting up the huge set my Dad bought for just $65. Two lanes of track filling what would eventually be a 4’x 8′ plywood board, not to mention one of the large Borsig loks with its familiar mounted side panels at the front; four passenger cars and several freight cars. I still have most of the pieces and all the cars. Hopefully I’ll be able to get the lok working again at full strength n’ steam. Marklin made the best, hands down. I’d visit the nearby large PX (yeah, that’s Army sprache, but my parents were in the Army Air Force before it split off and old habits are hard to break.) and be totally bummed with what I thought was a sad collection of American HO’s with mostly freight cars and very clunky diesel locomotives. How snotty, I’ll admit it. And how spoiled. Especially when I look back and recall that my Dad’s pay was nowhere near what a Lt. Col. receives now. But my parents were frugal, especially my Mom. Maybe it was their upbringing in New England during the Great Depression. They weren’t Yankees, but everybody learned how to stretch a dime, much less a dollar. The same held true when we arrived in Germany when it was still on the DM. I was always impressed with the Bundesbahn and its recovery after WWII and the relatively excellent shape of her major terminals that suffered a hell of a beating. (Sadly, when I worked in Boston a decade later, I’d use Boston’s once famed South Station, which at one time nearly equalled the huge glass sheds in Frankfurt, A.M. and Leipzig. It was nothing but a bad memory reeking of the urine of drunks and bums; totally shabby. And that was in a time when Boston was making a comeback (mid-seventies.) Still sad. At least Germany did something with its rail system when they received their Marshall Plan funds. When American private rail companies got their tax breaks, all they did was ask for more at the same time they were pulling more equipment out faster than a horde of Russians in the Eastern Sector. At least Germany had pride and it showed. Her stations and streets were safe to take a stroll in for even a fifth grader who’d never stepped foot by himself in Germany. So when I read about Goering’s massive set later in life, I couldn’t help a great sense of sadness to realize that due to his murderous policies and actions, not to mention all the other acts of mendacity, looting, and shameless pursuit of lucre even to the point where his greed unnecessarily left a lot of German soldiers stranded without vital supplies just to survive the Russian winters. And there he was, sitting in Carinhall behaving like a big fat corpulent pig playing with his trains while a lot of German civilians were left unprotected in their apartments and their sons, husbands and brothers were left to make it by themselves on the Russian and Ukrainian Steppes. While I’m glad that the Nazis were defeated, it was to their eternal shame that so many Europeans and Americans and Jews were made to suffer such horrors due to men like Goering. (I can’t help wonder if he didn’t have a mock concentration camp made for his basement set by one of Himmerl’s SS members. It’s such a shame that so many good Germans who had nothing to do with Goering’s shabby treatment of the Luftwaffe and the Concentration Camps he initially established were forced to endure, suffer and in the case of many untold thousands, die. Ironically enough, down the street where we first moved into that crowded apartment loft for my parents and two older and larger brothers, there was another notable German pilot who was buried in Wiesbaden’s Sudfriedhof. His name is Manfred Von Richtoven, aka “The Red Baron,” a far nobler man and truer representative of German manhood. That would be fine, but some of our images here have been sourced from other publishers and referenced as such. Please note those when you are including those images in your references.